Tariffs, interest rates, and recession struck fear deep in the heart of investors as 2019 was beginning. A market crash, a world financial crisis, or something worse. Here are some facts to help you keep perspective in these fearful times. Assuming a trade war with China, JP Morgan earlier this year concluded it would result in a $125 billion tariff on $500 billion worth of imports on Chinese goods, but shave U.S. economic growth in 2019 by just one-tenth of 1%, according to an October 8, 2018 by Bob Davis, a senior editor at The Wall Street Journal. 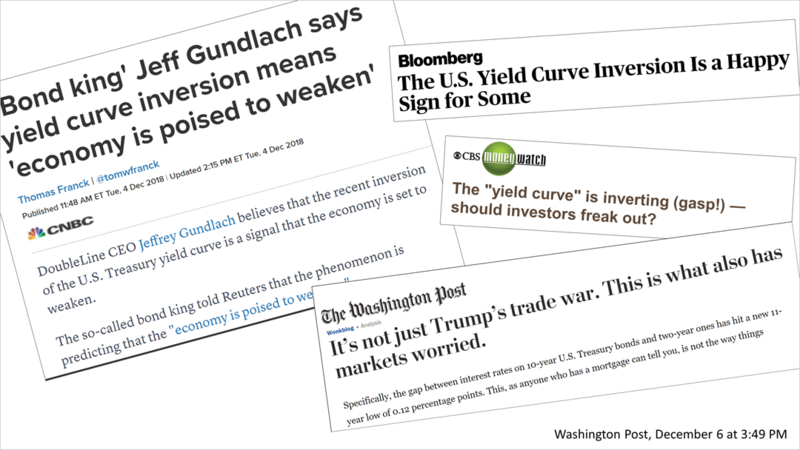 Frightening headlines about Fed monetary policy have widely reported that, with the yield curve inverted, a recession is on the horizon. Actually, what the yield curve central bankers care about most — the one used to predict a recession — has not inverted. The financial press often mistakenly reports on the two-year versus 10-year Treasury bond when the yield curve that's most relevant in forecasting recessions is the 90-day Treasury. No one can predict the next market turn and past performance is not a guarantee of the future of your investments. However, key economic fundamentals, like monthly orders by purchasing managers at large companies, were near a record high in November; real wage gains, which have repeatedly broken record high for three years, according to the Bureau of Labor Statistics, grew in the 12 months through October by 1.1%. These are not signs of a recession.